Happy Tuesday morning, everyone!! I hope that your day is going well so far! 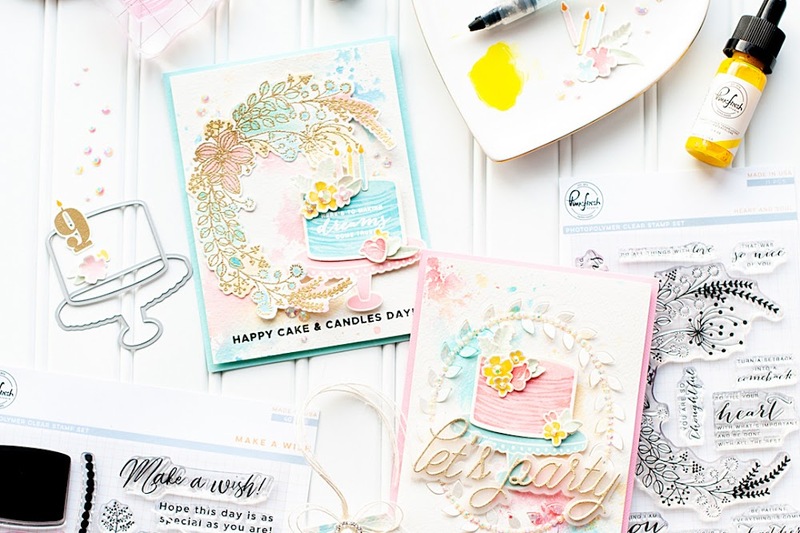 I am joining in on the Taylored Expression "Blast from the Past" blog hop fun this month...and I loved breaking out TE stamps for it!! I am also entering it into the "Shabby & Vintage" Moxie Fab challenge! So....let's get right to it!! Here is my card for the hop! Instructions: Fold cream cardstock in half to make card base. Adhere a block of blue flocked dot paper to the front of the card. 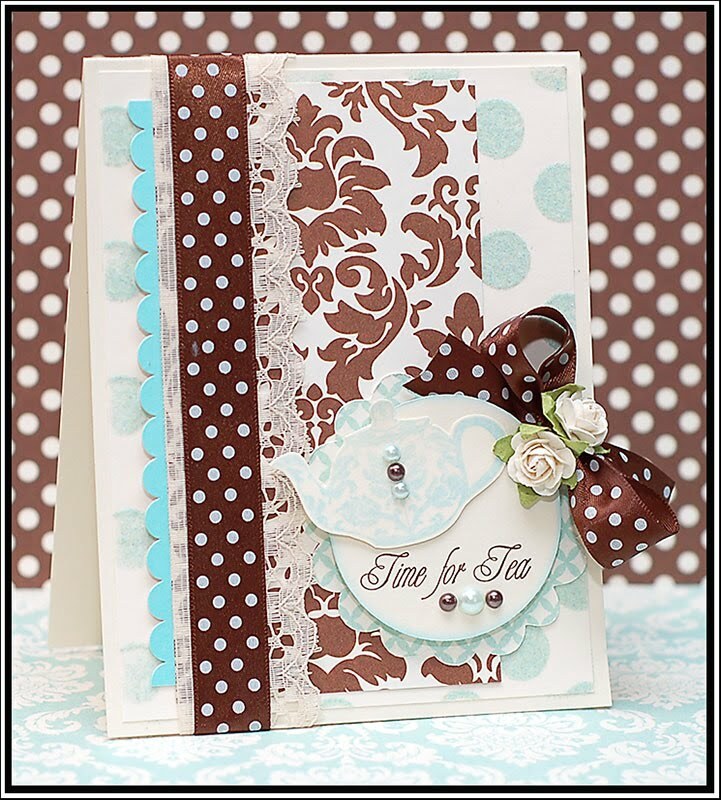 Add a blue paper frill to a brown damask paper block, and adhere to the left side of the card. Layer lace and ribbon over top of the seam on that paper block. 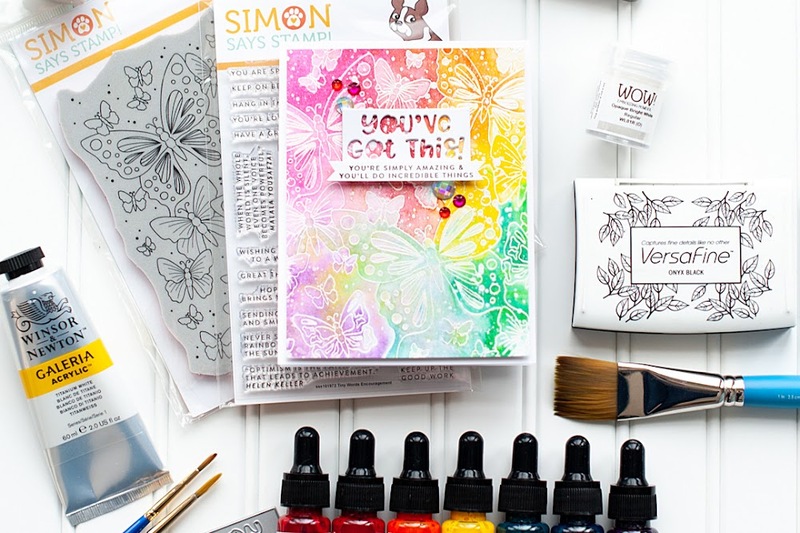 Cut the scalloped circle at 2 1/2" inches from patterned paper using the Cricut Expression and the Storybook cartridge. Adhere it to the lower right corner of the card. Tie a bow from brown dotted ribbon, and adhere to the upper right part of the scalloped circle. Cut a circle at 2" from cream cardstock and ink the edges. 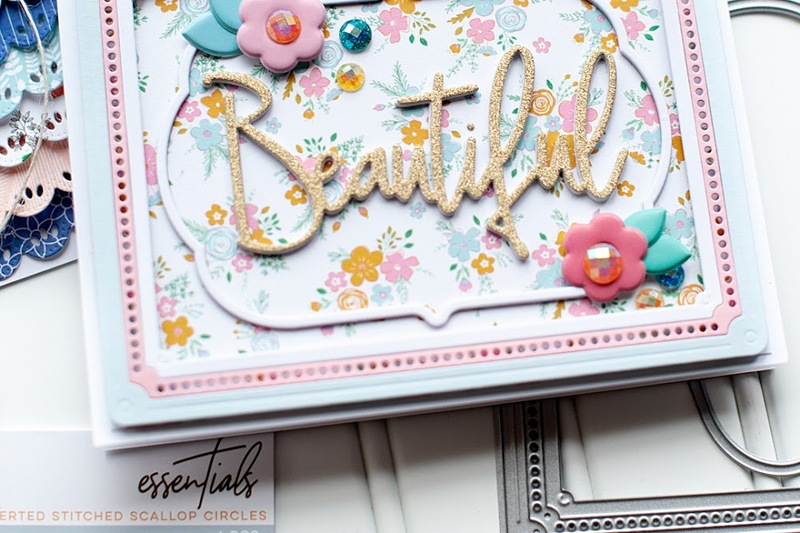 Stamp the sentiment to the bottom and adhere to the middle of the scalloped circle using dimensional adhesive. Stamp the teapot to cream cardstock and cut out. Adhere the teapot off center to the sentiment circle, and accent with pearls. Add two cream paper flowers to the middle of the bow. We were given a sketch by Sankari Wegman that we could use if we wanted to...and you all know me! I love a good sketch...so of course, I used it. Here is the sketch so you can try it out if you like!! I hope that you have a really wonderful day!! Wowza! This is stunning! So soft and pretty and perfect...and it matches my bathroom colors perfectly! WOW!!! Such a beautiful card. I loved the ribbon and the details in the card...Really Awesome!!! Such a beautiful card Lea! I just love the soft blue and browns! This is GORGEOUS Lea! LOVE the papers and colors on this! Totally STUNNING!! It's stunning!!! Sooo beautiful! Love that combination of white, blue and brown, soooo gorgeous!!! I love everything about your card! The lace, the brown dot bow, the flowers! It's all so beautiful! You are such an inspiration! Wowzers! Just stunning!!!! Everything about it is just perfect!! This is so beautiful - I love these yummy colors! Oh WOW, this is so elegant and deliciously shabby, LOVE it!! This is my first time visting your blog and I can't tell you how glad I am that I did. Your card is stunning. Every little detail is breath taking. I will be back often! This is beautiful, I love the ribbon and the roses, so elegant looking and lovely. Oh wow! The roses with the ribbon are absolutely gorgeous!! Love all the brown and white polka dots - it's beautiful! This is amazing!!! I love the colour combo, the polka dots, the flowers and wonderful loopy bow, and the sweet pearls. You have a perfect eye for detail!!! Oh this is just gorgeous!! Fabulous creation! Lovely card! Totally awesome. I love the colors you used. Very pretty, I love the lace and the roses! Beautiful card!! Very nice job! WOW!!! What a beautiful card...I love the gorgeous colors, ribbon, and papers you used and your little teapot looks sooo pretty with the pearl details!!!! I love tea! So anything with tea is Awesome to me! Gorgeous card...love the colors you used on it! Very pretty! Love the brown and turquoise combo. Oh my goodness, this is absolutely GORGEOUS!!!! I love the shabby chic look of your card.